Over the weekend, we wrapped up our ‘How Microsoft can save Xbox games on Windows Phone’ series with a Microsoft video interview that we’d been saving for just such an occasion. That video focused exclusively on the Xbox Windows Phone issues raised in our editorial series, but it didn't exactly put our concerns to rest. All we Xbox enthusiasts can do is keep pushing the editorials and issues with Microsoft until finally the right people realize the need for improvement and start effecting changes. And while many of those issues have yet to be resolved, I’d be hard-pressed to claim that Windows Phone gaming has not improved since the debut of Windows Phone 8. Game development is easier than ever, and many companies who ignored Windows Phone 8 are now onboard for 8. When we sat down to talk with Microsoft's Larry Lieberman, Senior Product Manager and Casey McGee, Senior Marketing Manager, our first subject of business was all those recent advances that make Windows Phone gaming better than ever. Head past the break to learn just how things are looking up and see the second part of our video interview! A huge obstacle to Windows Phone 7 development was the platform’s lack of native code support. This made porting from other platforms to Windows Phone incredibly difficult because games and apps had to be rewritten from their original code languages into C# and XAML. The lack of native code support also made multiplatform game engines incompatible with Windows Phone. Since the vast majority of mobile games are built with multiplatform game engines (especially Unity), a number of games never migrated to Windows Phone 7. The major theme that Microsoft touted during our meeting was that Windows Phone 8 has removed obstacles like the lack of multiplatform game engine support. They touted support from Unity, Marmalade, and Havok, three of the most important engines in the business. Unity: The most popular mobile gaming engine by far, the Unity SDK for Windows Phone 8 has been in beta for several months now. As a result, a handful of Unity games have recently made it out of the gate: Temple Run, Fling Theory, Orcs Must Survive, and Drift Mania Championship 2. Unity also announced Unity 4 beta support for Windows Phone 8, so developers can begin working with the latest version of the engine and its advanced features. 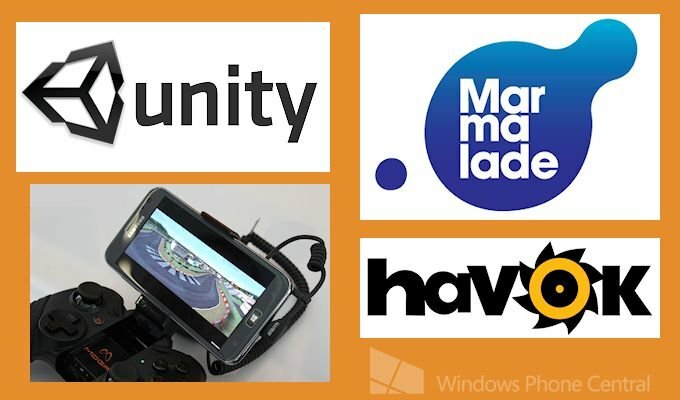 Marmalade: A versatile engine that is used in a variety of popular games on other platforms such as Plants vs. Zombies and Cut the Rope has just advanced to its second beta version for Windows Phone 8. Two Marmalade games are already available on the platform: 6th Planet and Propel Man. Learn more about the beta program at Marmalade’s website. Havok: A huge player in the console field, Havok also has a number of tools in beta status for Windows Phone 8, including the Havok Physics Engine (seen in Modern Combat 4), the Havok Game Engine, and the Project Anarchy suite of tools. We’ll take an in-depth look at Havok’s offerings soon! Microsoft’s focus on helping to deliver these engines to Windows Phone 8 is definitely great news. In fact, I’d say it’s the only issue we touched on in the ‘How Microsoft can save Xbox games on Windows Phone’ series that has actually been fixed so far. That’s not to say all the important gaming engines have signed on for Windows Phone 8 yet; Epic’s Unreal Engine remains noticeably absent. Hopefully we’ll see Epic come onboard this year as well. Windows Phone 8 also offers developers increased access to the hardware, including better Bluetooth support. This in turn has allowed accessory manufacturer Power A to add Windows Phone 8 support to its MOGA Pro Controller. The controller just launched last week and games have to be updated to work with it, so it’ll be a month or two before we start reaping its benefits. But like the game engines mentioned earlier, the MOGA Pro Controller is another component that brings Windows Phone 8 closer to competing with other mobile platforms on the gaming front.